Toyota GB has announced it will recall a number of its Toyota Avensis and Lexus IS 250 models in the UK to carry out modifications to their fuel systems, following customer feedback in other markets. It is working with the Vehicle and Operator Services Agency (VOSA) to contact registered owners and keepers by letter to advise them of the procedure for taking their vehicle to an authorised Toyota or Lexus repairer for the necessary repair work to be done. The issue affecting certain Avensis 2.0-litre and 2.4-litre petrol engine models, produced between July 2000 and September 2008 and is related to potential concerns with the fuel system. The first is related to the fuel pipe, where small cracks can potentially develop after a long period of time. The second concern is related to potential insufficient tightening of the fuel pump check valve. In the worst case, these issues may cause fuel to leak. There have been no reports of accidents related to this condition. No complaints related to this issue have been reported in the UK. The repair involves replacing the fuel pipe and the fuel pump check valve. The job will take approximately two to four and a half hours to complete, at no cost to the customer. 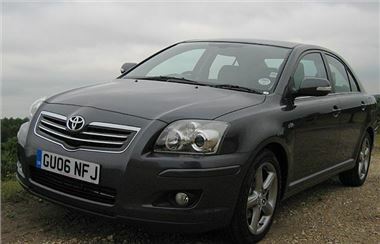 Approximately 15,500 UK registered Avensis vehicles are affected by this recall. The issue affecting certain Lexus IS 250 petrol engine models, produced between August 2007 and February 2009, is related to the fuel pressure sensor. Due to possible insufficient tightening, the fuel pressure sensor could loosen and in very rare cases fuel could leak. There have been no reports of accidents related to this condition. The repair involves retightening the fuel pressure sensor. If the fuel is leaking, the repair will involve replacing the fuel pressure sensor gasket. The job will take approximately one hour to complete, or three hours if the gasket needs to be replaced, at no cost to the customer. Approximately 3100 UK registered Lexus IS 250 vehicles are affected by this recall. Jon Williams, Managing Director of Toyota GB PLC, said, "We are committed to putting the customer first and have a total focus on the quality of all our products. We will liaise with our customers to carry out the repair procedures as efficiently as possible, with minimal disruption."